In the 1920 Peter Weddell read The Expedition of the Donner Party and its Tragic Fate and was hooked. Then he read the McGlashan classic, The History of the Donner Party. 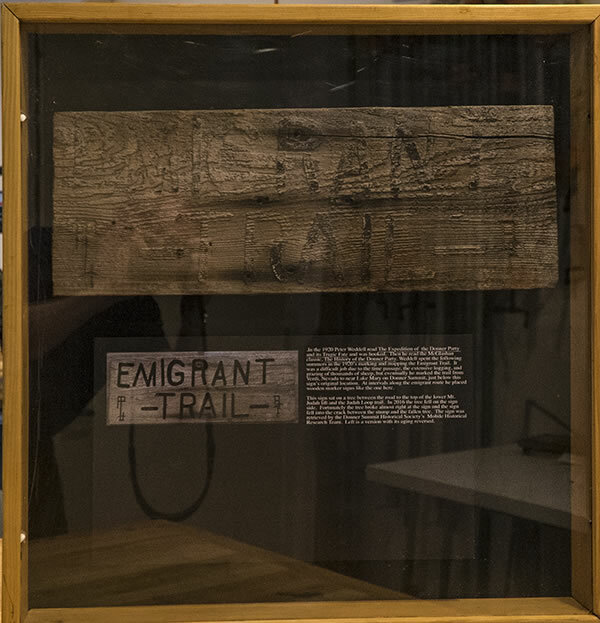 Weddell spent the following summers in the 1920’s marking and mapping the Emigrant Trail. It was a difficult job due to the time passage, the extensive logging, and grazing of thousands of sheep, but eventually he marked the trail from Verdi, Nevada to near Lake Mary on Donner Summit, just below this sign’s original location. At intervals along the emigrant route he placed wooden marker signs like the one above. This sign sat on a tree between the road to the top of the lower Mt. Judah lift and the Judah Loop trail. In 2016 the tree fell on the sign side. Fortunately the tree broke almost right at the sign and the sign fell into the crack between the stump and the fallen tree. The sign was retrieved by the Donner Summit Historical Society’s Mobile Historical Research Team. Below is a version with its aging reversed by the DSHS MX-1000 Historical Rejuvenator. Most of the signs are gone but there are still a couple on the flank of Mt. Judah. One is about 20 feet from the one above and two more are down near Lake Mary. "P. M. Weddell of San Jose is a man who sincerely, and honestly wants to serve his fellowman. Many years ago he realized what a tragedy it would be to allow Old trails to be gone and forgotten. Two deep ruts of ancient Wagon scars in the earth were precious Landmarks to him, and should be preserved for posterity. 'Maybe if this generation doesn’t appreciate it, another will,' has been his philosophy, and doubtless a good one. 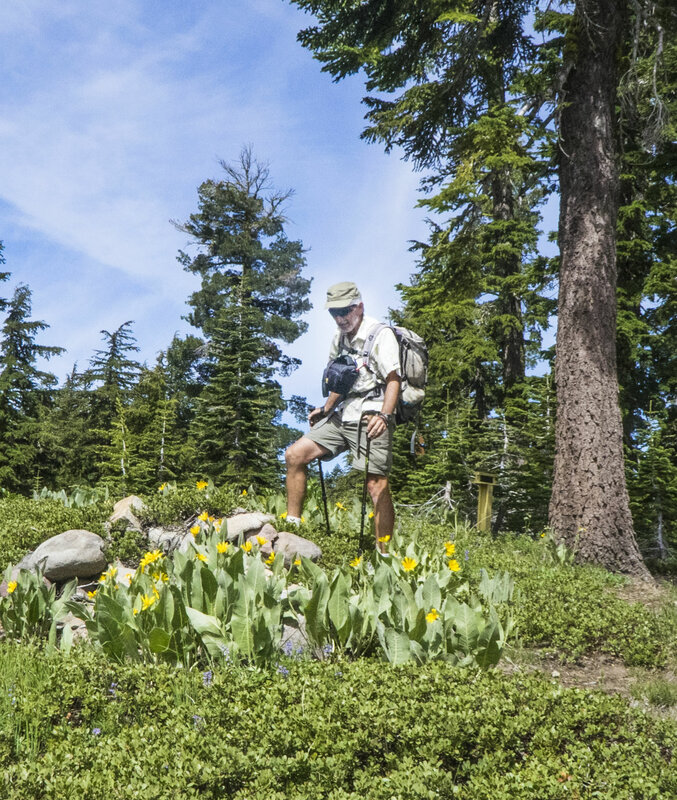 Until recent years Mr. Weddell has been a schoolteacher of commercial law, and during vacations he spent his time in the Sierra Mountains on old trails, or the desert regions beyond." Above Peter Weddell with a rock cairn at the top of Coldstream Pass (between Mt. Judah and Donner Pk.) The cairn is still there with a painted commemoration - below. Art Clark of the DSHS Mobile Historical Research Team with the Weddell cairn. 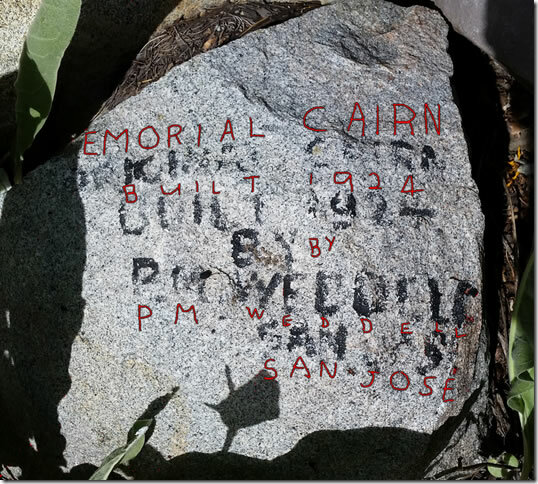 Below is the rock with the commemoration, "Memorial cairn built 1924 by P.M. Weddell San Jose." Photo and transcription courtesy of Art Clark.